Quantifoil® Holey Carbon Film is a perforated support foil with a pre-defined hole size, shape and arrangement. They are offered with circular and square, orthogonally arranged holes. The film is mounted on a standard Ø3mm Cu, Au, or Ni TEM grid with 200, 300 or 400 mesh. 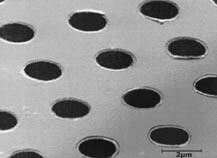 They have advantages in electron microscopy (EM) or low-energy electron point source (LEEPS) microscopy when compared with conventional holey film. The final thickness of the foil is about 20nm, although only 10nm of carbon is evaporated onto the plastic. NEW film geometries have been added! R 3.5/1 (hole diameter/distance between holes), R 2/1, R 1/2, R 0.6/1 have been added to the existing popular R 2/2 and R 1.2/1.3 products. 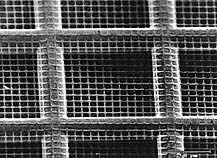 All films are now available on 400 mesh copper and gold grids, in addition to 200- and 300-mesh. We also offer continuous Ultrathin Carbon film on selected geometries. Available as 100 grid packs, as well as 10-packs on most products. Thickness of carbon is 2nm. With the known size of the pore of the Quantifoil®, one can estimate the size of a particle observed directly. 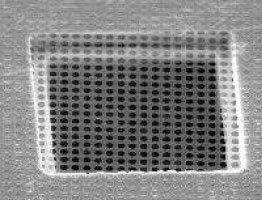 With the defined size and pitch of the holes in the Quantifoil® one can use automated electron microscopy for the first time. The Quantifoil® 7/2 gives a good portion of "free" area. Hole size and hole distribution uniform over a wide range.